January 2016 – Arkansas Glasshoppers, Inc., Welcomes You! 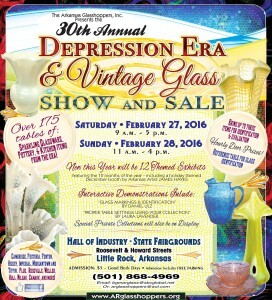 The Arkansas Glasshoppers, Inc., invites you to its 30th Annual Depression Era & Vintage Glass Show & Sale at the Hall of Industry, State Fairgrounds, Roosevelt & Howard Streets, Little Rock, Arkansas. We are excited to celebrate 30 years bringing to Arkansas the largest annual Depression Era and Vintage Glass Show & Sale! Show dates are Saturday, February 27, 2016, from 9:00 a.m. to 5:00 p.m., and Sunday, February 28, 2016, from 11 a.m. to 4 p.m. Admission of $5 is good for both days. Parking is free. Twenty-four outstanding dealers from 14 states will display over 175 tables of sparkling glassware, pottery, and kitchen items of the era. Elegant glassware will also be available including Cambridge, Fostoria, Fenton, Heisey, Imperial, Morgantown and Tiffin. Pottery will include Roseville, Weller, Hull, Niloak, Camark, and others. The private glass collection displays will include a collection of glass to celebrate the spirit of each month of the year. James Hayes, the internationally-acclaimed glass artist who is a member of the Arkansas Glasshoppers, is creating a special display to celebrate the month of December using hand-blown Christmas ornaments and decorations made in his studio in Pine Bluff, Arkansas. This year for our special 30th Show, we are having interactive presentations throughout both days. Table Settings by club member Laura Lavender will show you how to create unique and memorable table settings using a combination of pink, blue, green, and yellow Depression Era glass. The Table Settings presentations will be held on Saturday at 10:30 a.m., 1:30 p.m., and 3:00 p.m., and on Sunday at 11:30 a.m. and 2:00 p.m. Identification Marks by club member Daniel Ulz will show you how to find and interpret identification marks on glass to help you learn what kind of glass you have or want to collect. The Identification Marks presentations will be at 10:00 a.m. and 2:00 p.m. on Saturday and 1:00 p.m. on Sunday. If you would like assistance identifying and evaluating what type of glass you have, we will have a reference table for glass identification. Each visitor may bring up to 3 items for identification or evaluation. Visitors also have the opportunity to win door prizes on the hour. The building is handicapped accessible and a snack bar is available. For more details and information about the show, please see the page dedicated to the show on this website or find us on Facebook and YouTube using the links on this website. The Show Chair, Bud Martin, can be reached at (501) 868-4969 or bgmarglass@sbcglobal.net.